Flat roofs do not drain as effectively as pitched roofs. As a result, flat roofs are notorious for developing ponding water. Ponding water is defined by roofers as water that stands in a puddle on the roof for longer than 48 hours. While this is not an immediate threat, over time ponding water will begin to wear on the roofs membrane, thus shortening its lifespan. Leaks will begin to happen if standing water is a recurring event. Flat roofs often slope slightly towards a gutter allowing water to flow into roof drains. Ponding water can easily be drained off the roof if these drains are clean and free of debris. Maintaining gutters and drains, or installing new ones will help keep ponding water off of your roof. Two of the most challenging causes of ponding water is sagging structure and compressed insulation. You can avoid these problems by frequent inspection of the roof. Eliminating minor structure and insulation problems could save you from having to replace your whole roof. 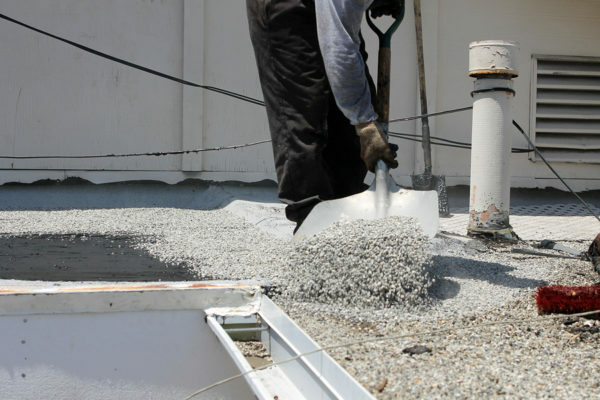 Hiring a reliable roofer who will properly install the flat roof, while avoiding compressing the insulation during the roofing process is another way to avoid sagging altogether. Pooling water is inevitable when the structure beneath the roof begins to sag. This problem cannot be solved by maintaining drainage systems on the roof because the roof is no longer sloped enough for the water to flow down to the drains and gutters. Compressed insulation can be caused by heavy roofing equipment resting on the insulation during installation. Repeated treading over the roof can also lead to indentations in the roof that cause pooling. When pooling occurs, the continual presence of water on the insulation will cause more saturation and damage. Once the structure and insulation are sagging it is difficult to repair without replacing the roof. If the membrane is damaged due to ponding on the roof a new membrane is worth considering, if replacing the roof is not an option at the time. Many on the market today are able to withstand ponding water, and can add to your roofs lifespan. At Atlas Home Repair, we are certified in coating application and we can direct you towards the right coating for your roof. Atlas Home Repair specializes in coating applications and roof replacements. If you are looking for a long term repair or a new roof installed by experts committed to quality, give us a call at (575) 522-0697 or contact us to request a free consultation.